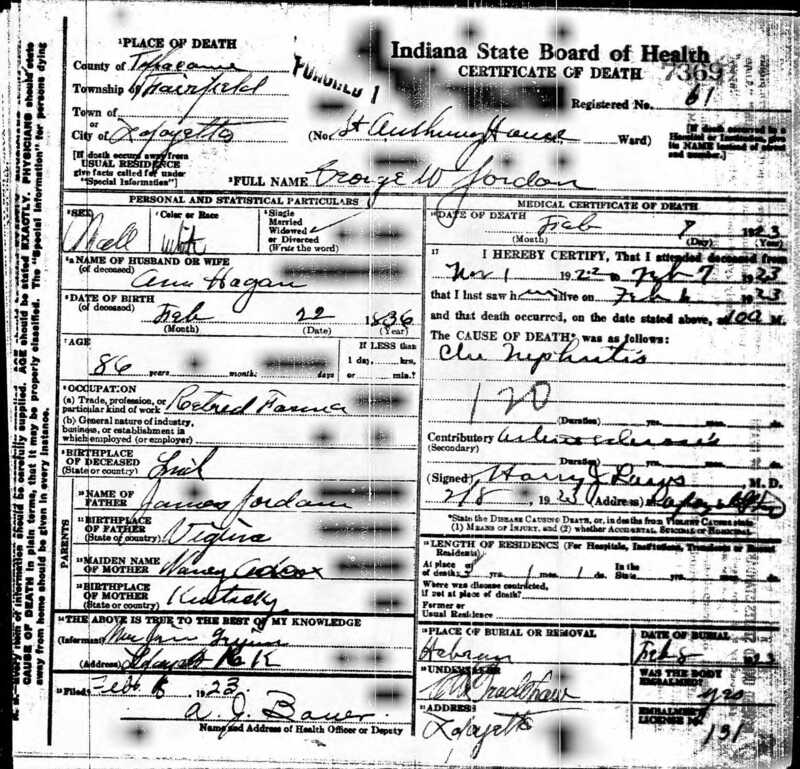 James Jordan, eldest son of William Jordan and Blanche Fullerton, was born circa 1796 in Greenbrier County, (West) Virginia and died on March 12, 1873 in Tippecanoe County, Indiana. He married Nancy Adcock in Cabell County, (West) Virginia on December 28, 1825. 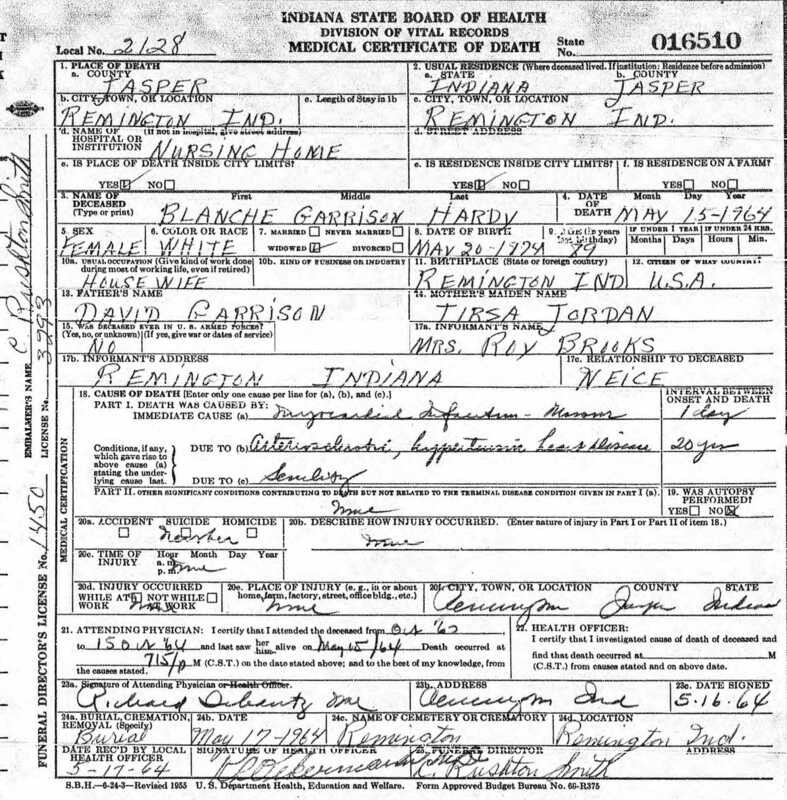 Nancy was born circa 1800 in Virginia and died in 1869 in Indiana. Both James and Nancy are buried in the Burton Cemetery, Tippecanoe County, Indiana. 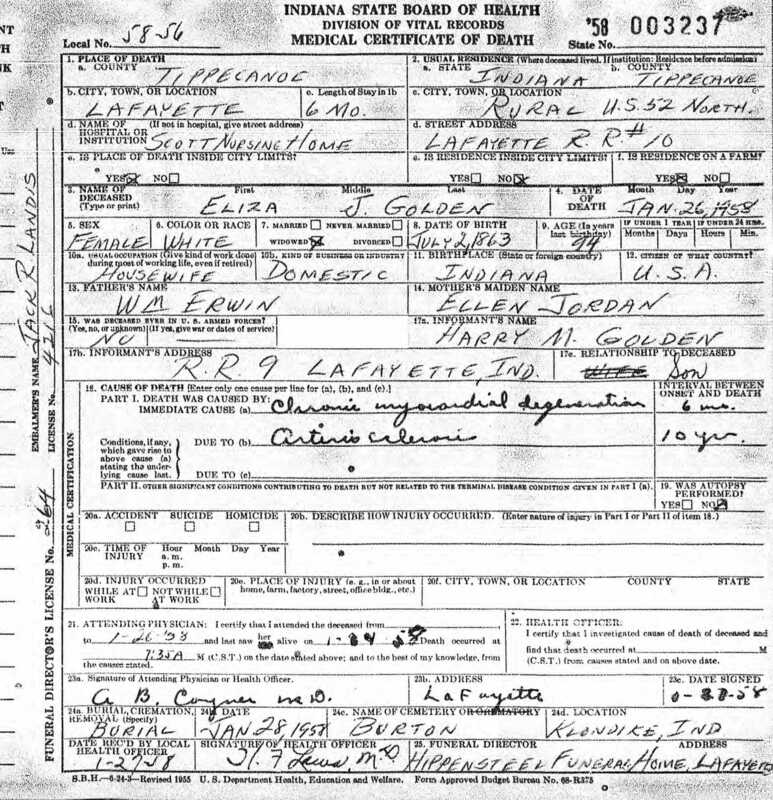 James is found in the censuses of 1830-TippecanoeIN, 1840-TippecanoeIN, 1850-TippecanoeIN, and 1860-TippecanoeIN. He is possibly also in 1820-CabellVA in the household of William Jordan. 1. 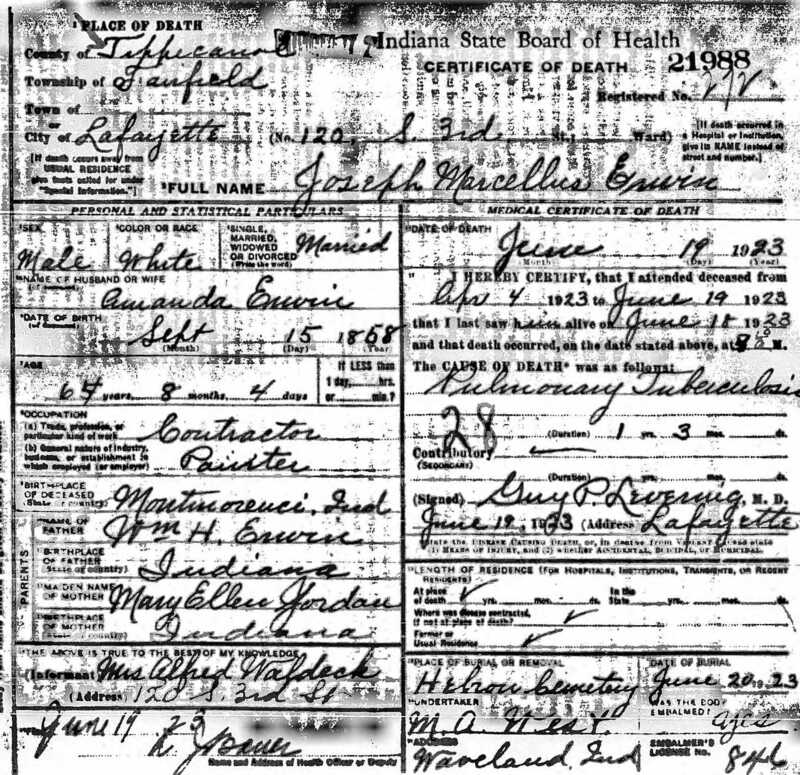 Jane Jordan was born February 11, 1827 in Cabell County (West) Virginia and died on October 14, 1880 in Junction City, Davis County, Kansas. She married Nathan Brown, a widower with two children, on September 29, 1842 in Tippecanoe County, Indiana. Nathan was born on September 13, 1813 in Bourbon County, Kentucky and died on May 24, 1897 in Junction City, Kansas. Both Jane and Nathan are buried in Highland Cemetery, Junction City, Kansas. 2. 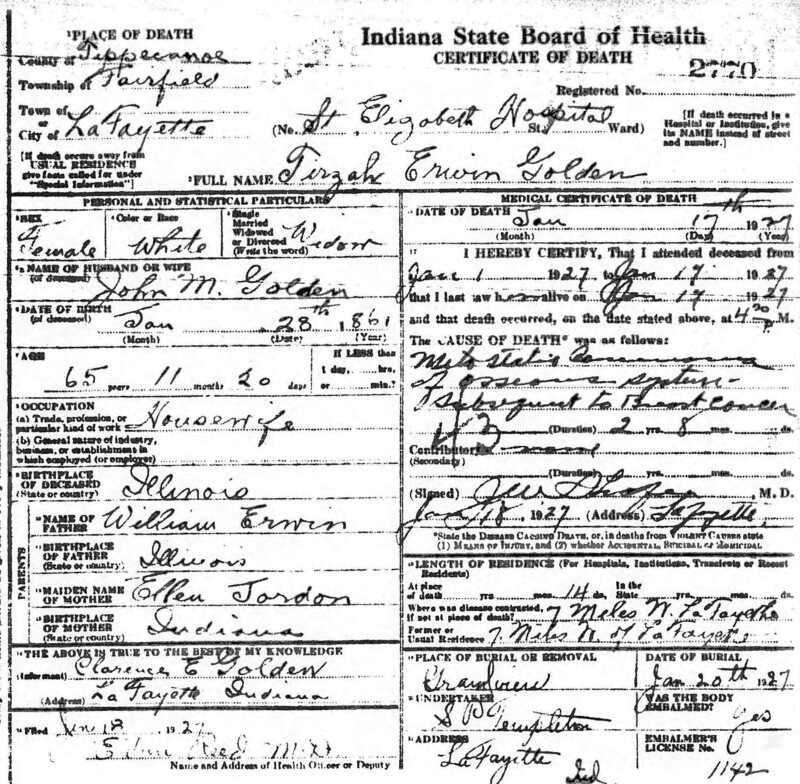 Elizabeth W. Jordan was born April 3, 1829 in Wabash Township, Tippecanoe County, Indiana and died November 6, 1906 in Montmorenci, Tippecanoe County, Indiana. 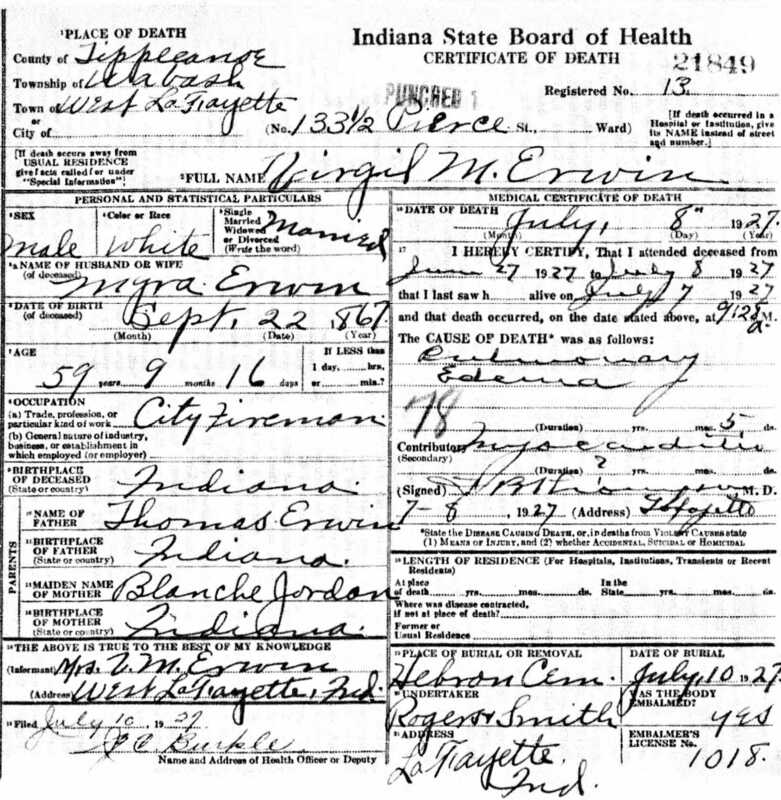 She married Robert Wylie Erwin in Tippecanoe County, Indiana. 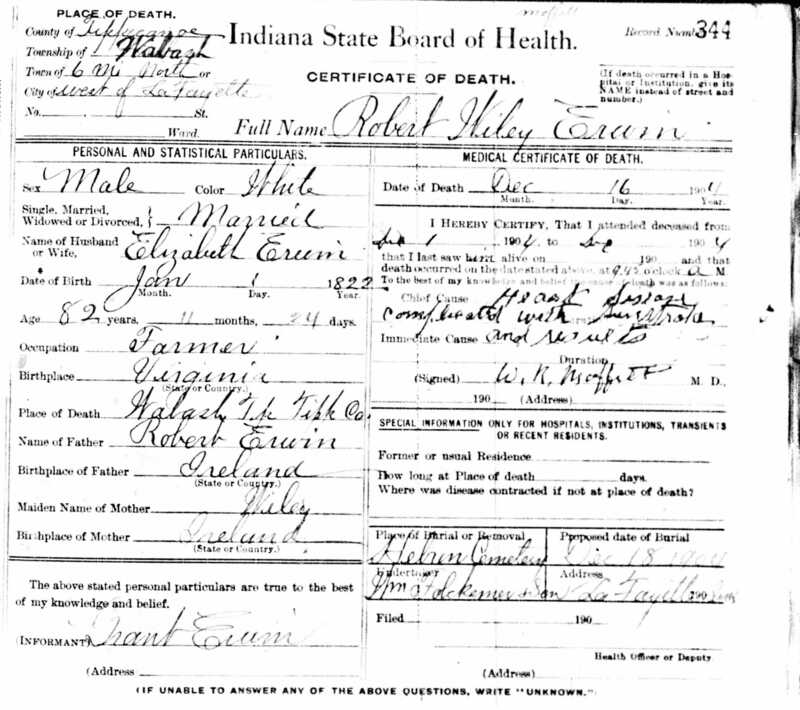 Robert was born January 1, 1822 in Virginia and died December 16, 1904 in Wabash Township, Tippecanoe County, Indiana. Both Elizabeth and Robert are buried in Hebron Cemetery, Tippecanoe County, Indiana. 3. 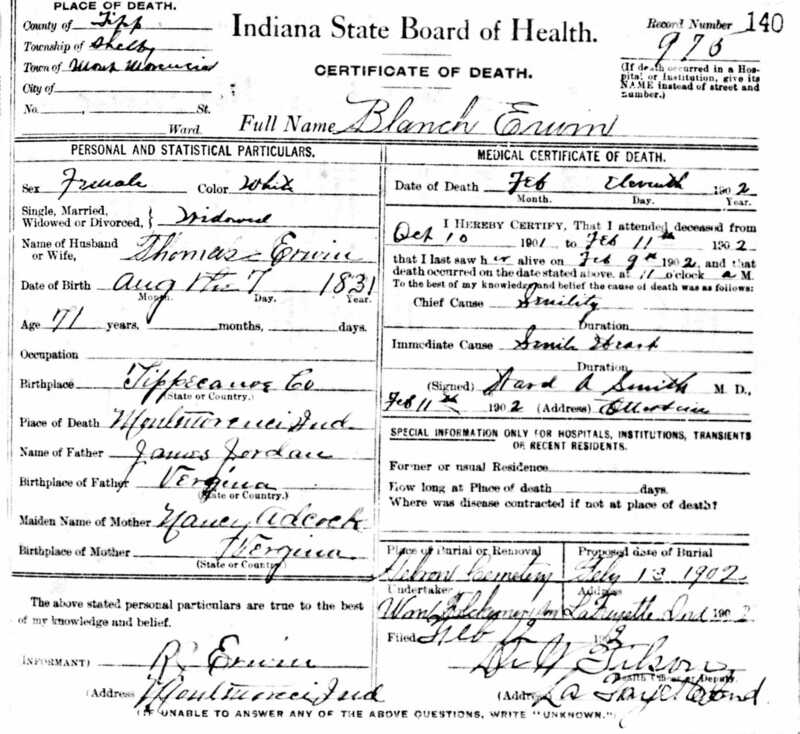 Blanche Jordan was born on August 7, 1831 in Wabash Township, Tippecanoe County, Indiana and died on February 11, 1902 in Montmorenci, Tippecanoe County, Indiana. 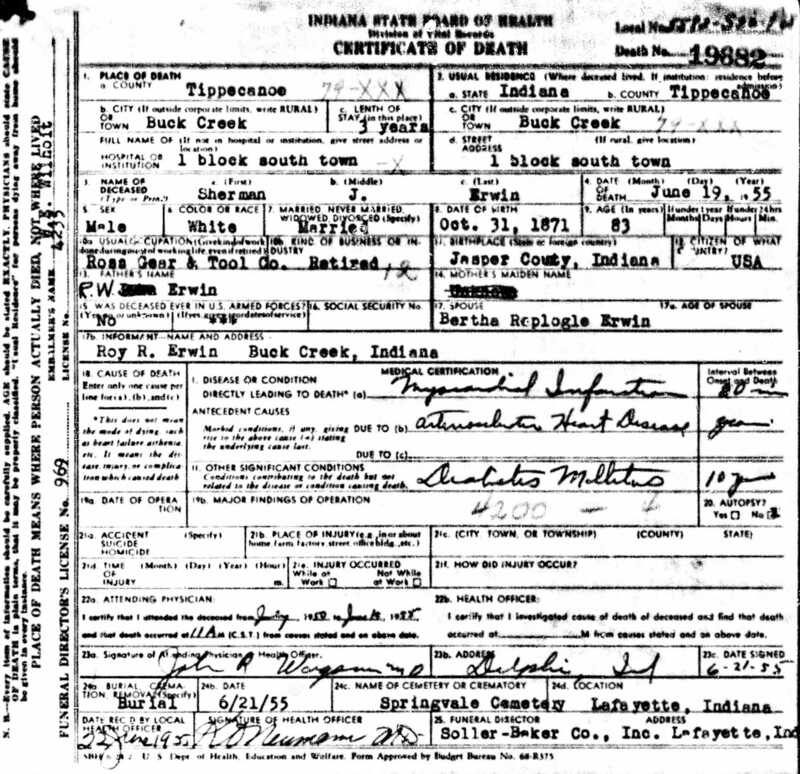 She married Thomas Erwin in Tippecanoe County, Indiana. Thomas was born in 1821 in Virginia and died in 1896. Both Blanche and Thomas are buried in Hebron Cemetery, Tippecanoe County, Indiana. 4. 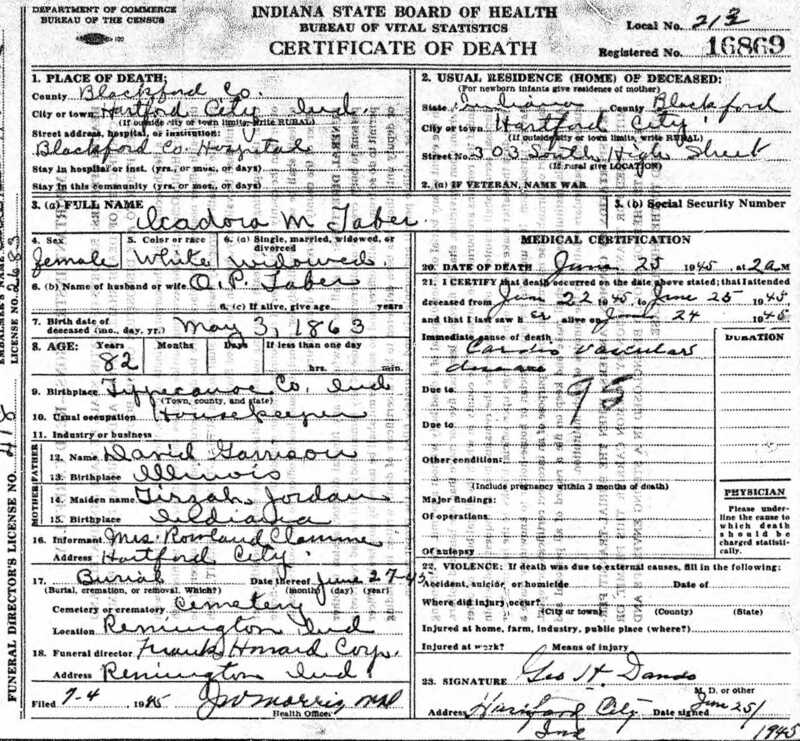 William H. Jordan was born on October 26, 1833 in Wabash Township, Tippecanoe County, Indiana, and died on June 17, 1892. 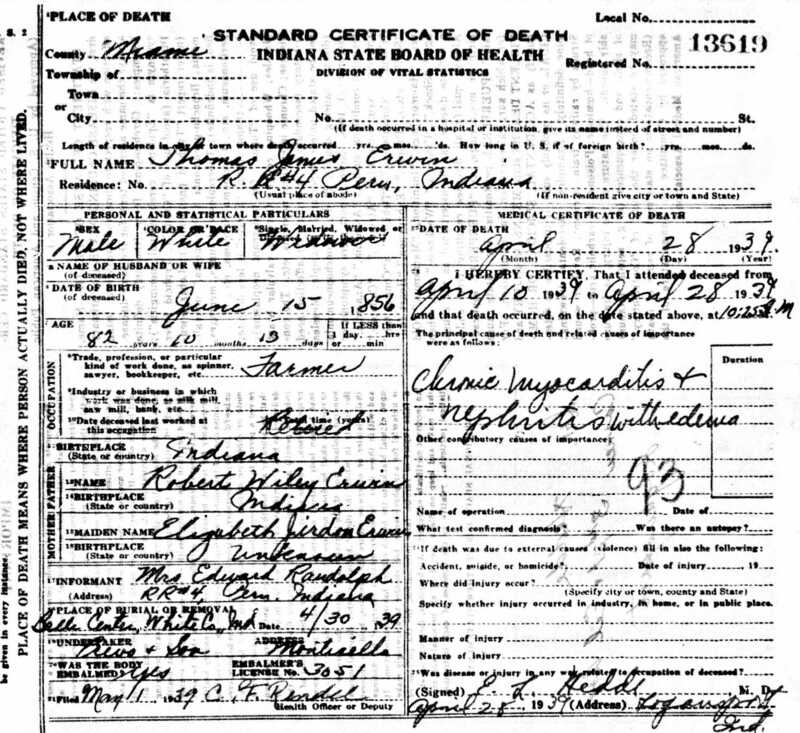 William married Ruth Ann Chamberlain, daughter of John C. Chamberlain, on March 23, 1856 in Tippecanoe County, Indiana. 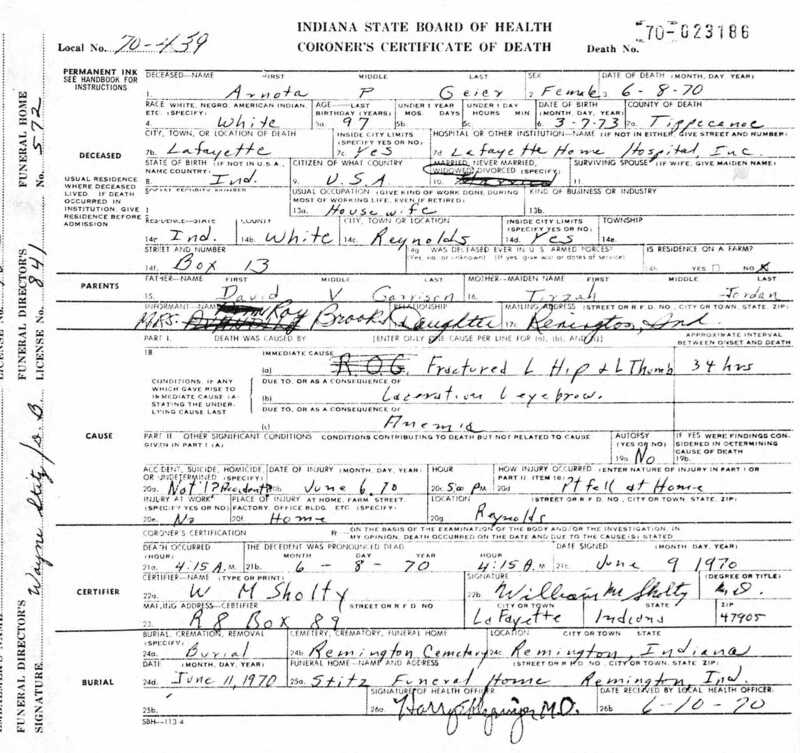 Ruth was born in Lafayette, Tippecanoe County, Indiana, and died on December 9, 1882. Both William and Ruth are buried in Burton Cemetery, Tippecanoe County, Indiana. 5. 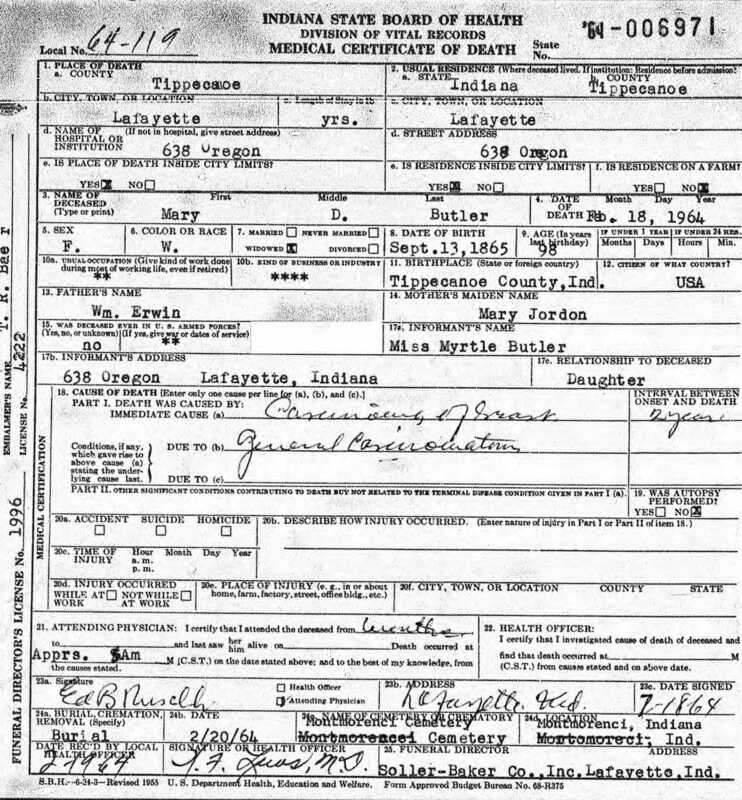 George Washington Jordan was born on February 22, 1836 in Indiana and died on February 7, 1923, In Lafayette, Tippecanoe County, Indiana. He is buried in Hebron Cemetery, Tippecanoe County, Indiana. George was married to Mary Ann Hagen. 6. 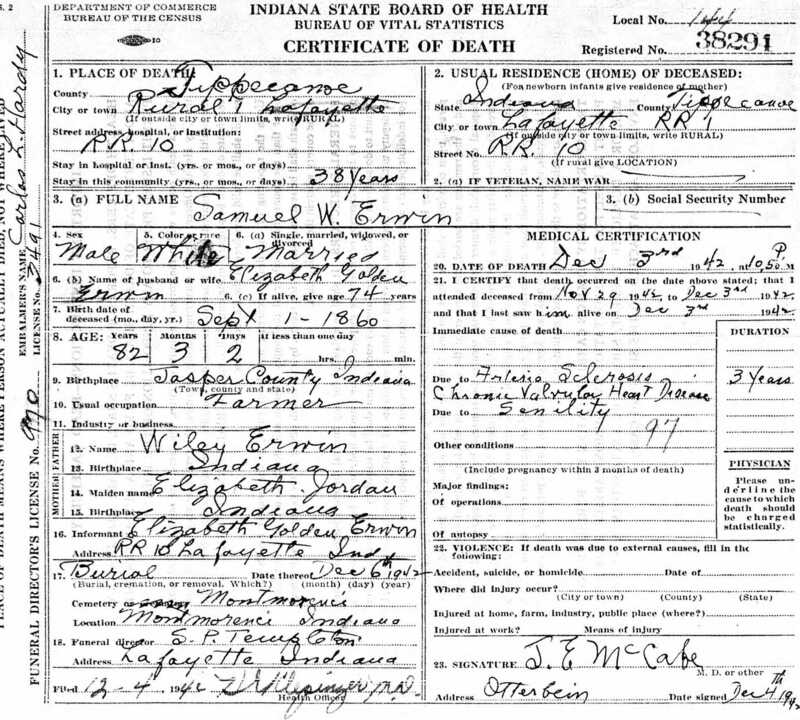 Mary Ellen Jordan was born on October 1, 1838 in Montmorenci, Tippecanoe County, Indiana and died on January 1, 1925 in Lafayette, Tippecanoe County, Indiana. 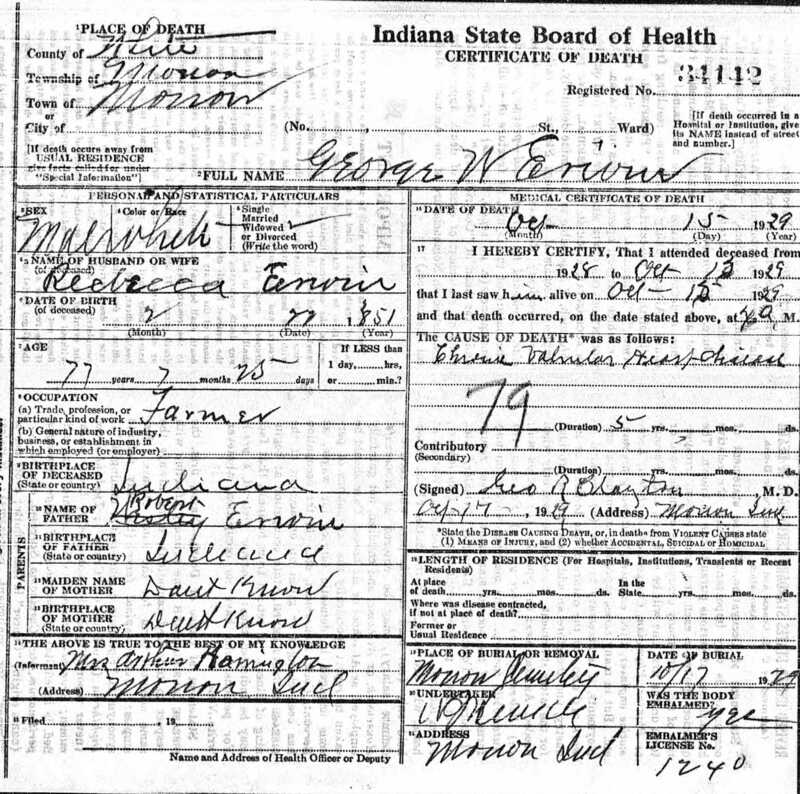 She married William Erwin on September 13, 1857 in Tippecanoe County, Indiana. 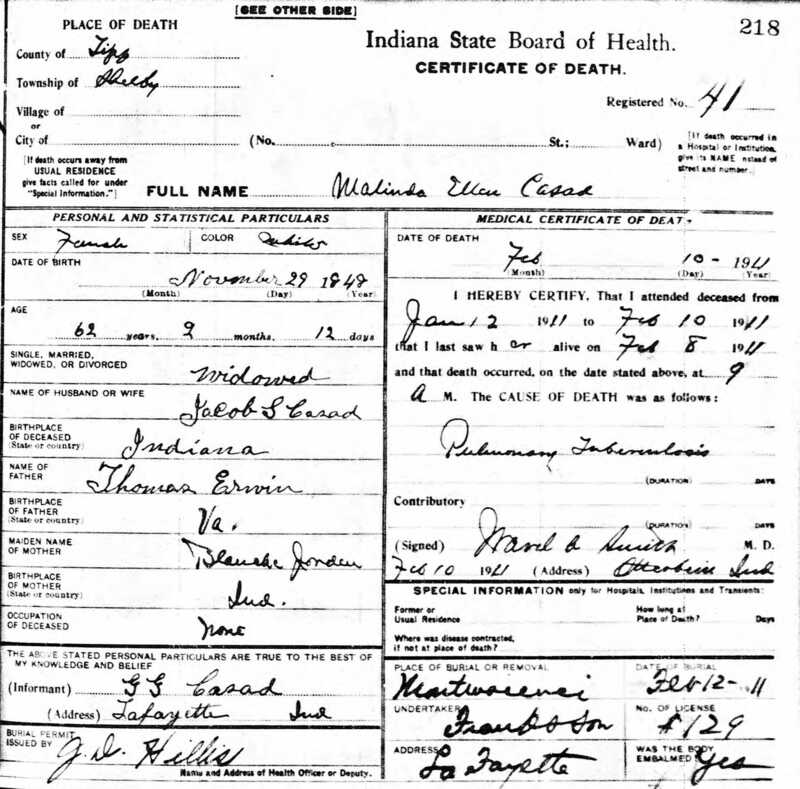 William was born on December 25, 1830 in Indiana and died on March 8, 1896 in Tippecanoe County, Indiana. Both Mary and William are buried in Hebron Cemetery, Tippecanoe County, Indiana. 7. Thomas A. Jordan was born circa 1842. 8. 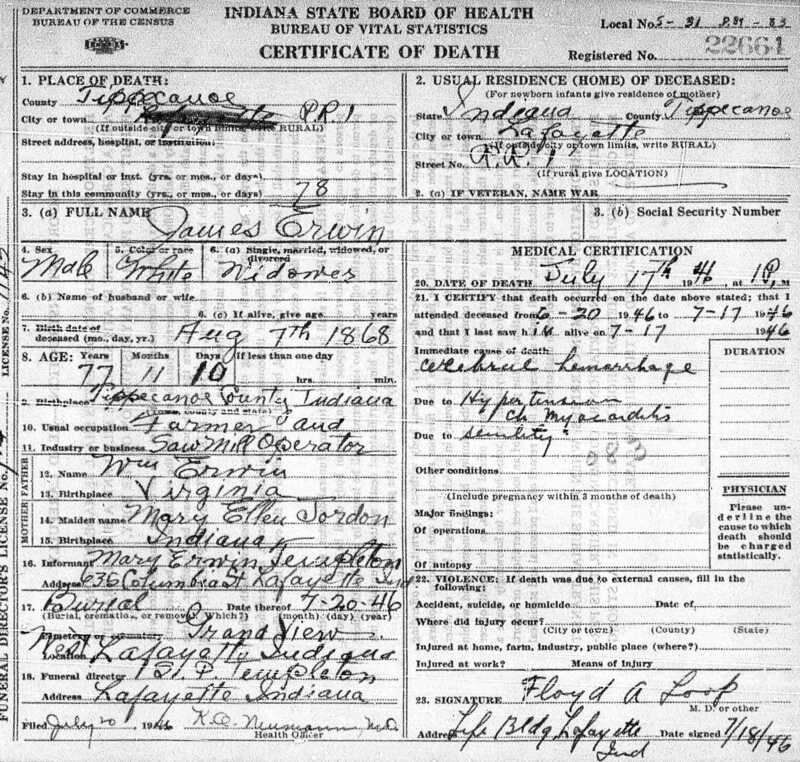 Tyrza Ann Jordan was born on December 8, 1842 in Tippecanoe County, Indiana and died on April 10, 1916 in Remington, Jasper County, Indiana. 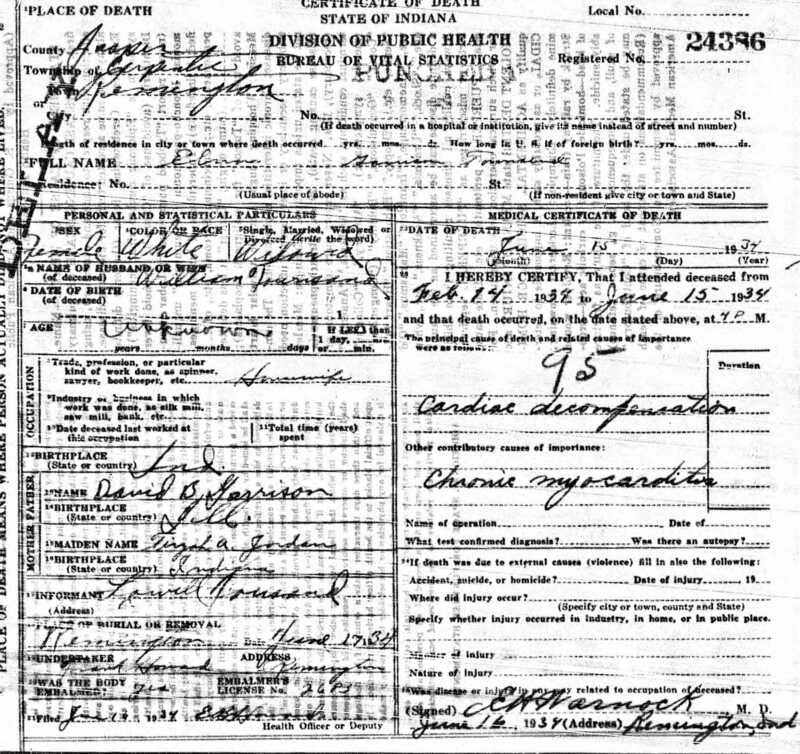 She married David Van Meter Garrison, son of James Madison Garrison and Mary Catherine Sloan, on June 3, 1858 in Tippecanoe County, Indiana. 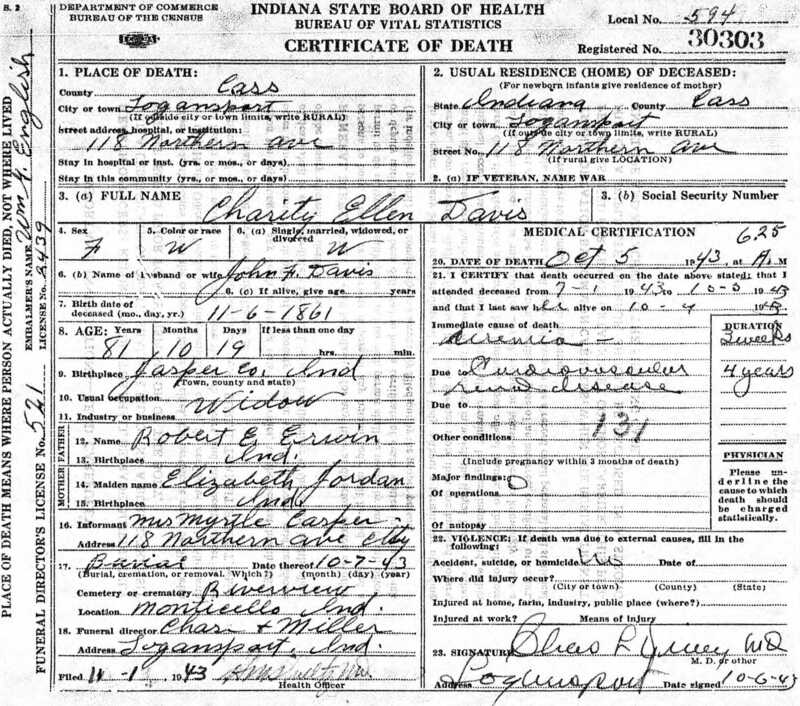 David was born on November 28, 1833 in Monmouth, Illinois, and died on March 27, 1913. 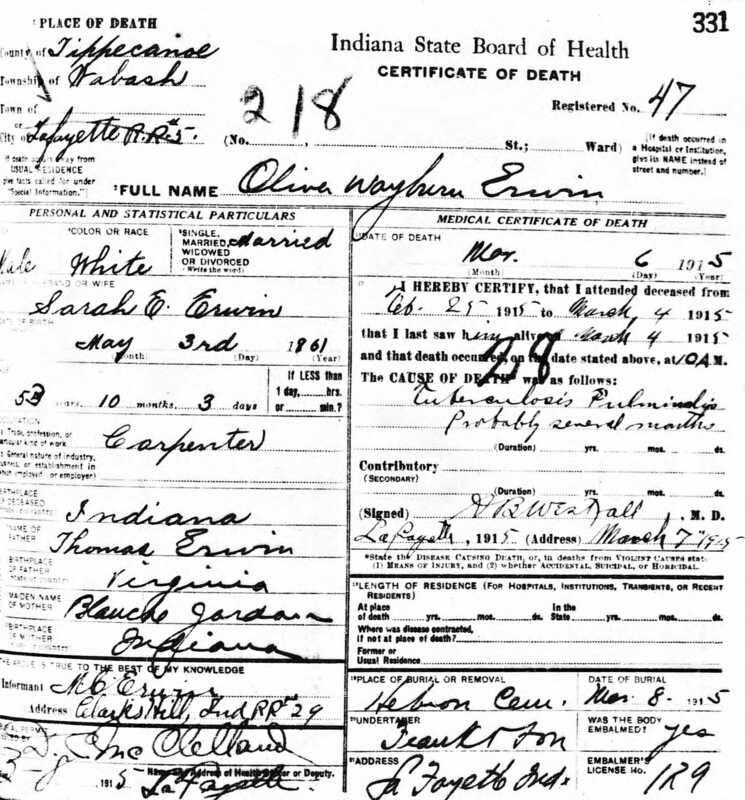 Both Tyrza and David are buried in Remington Cemetery, Remington, Indiana. 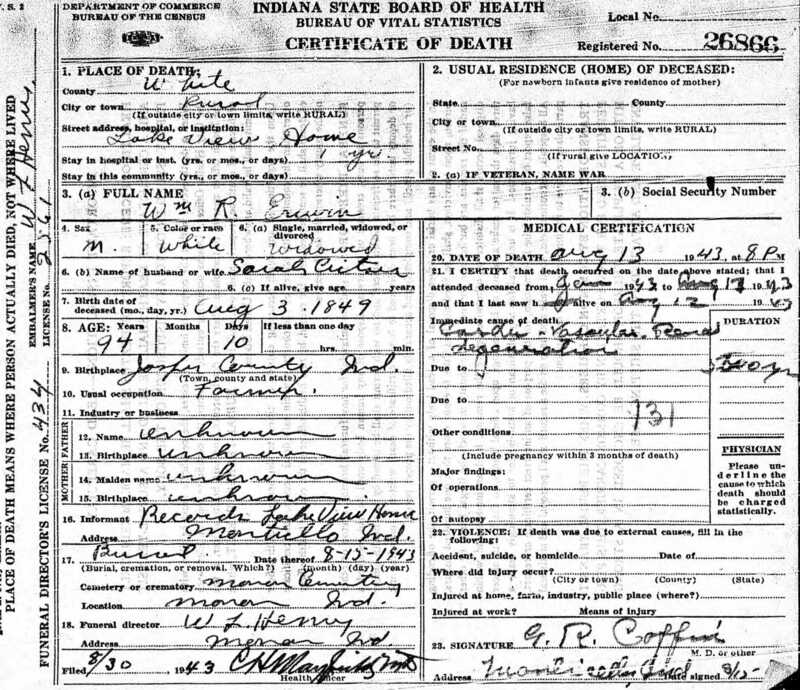 1 Proof that James Jordan is the son of William and Blanche is found in several land documents where the heirs of William Jordan are selling off their inherited land, including Tippecanoe County Land Record Books “W” (pp51-53 and pp71-72), and “29” (pp612-615 dated February 1847, and p108 dated April 1850). 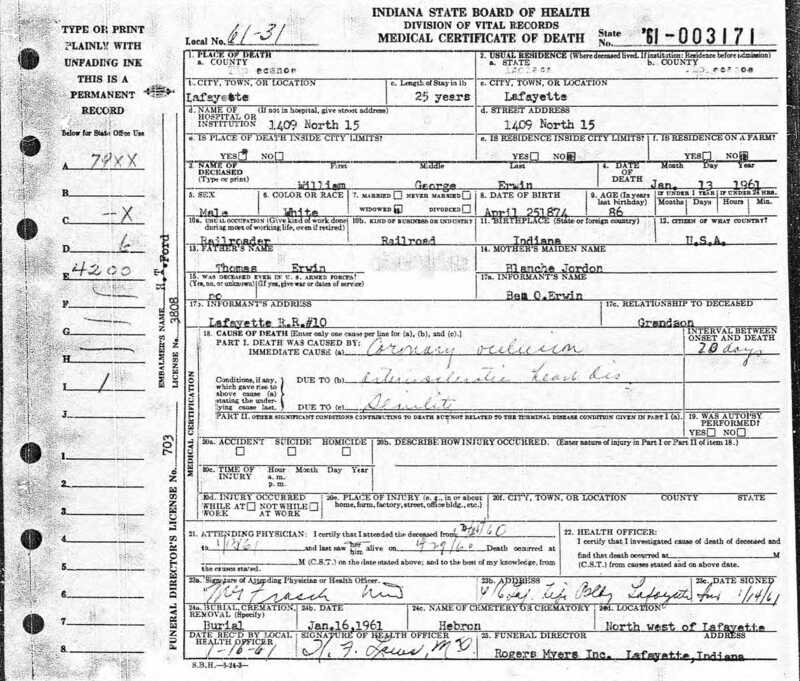 2 Dates and locations of birth, marriage and death for James and Nancy Jordan taken from Biographical Record and Portrait Album of Tippecanoe County, Indiana, published in 1889. Dates of birth for James found in censuses vary from 1796-1799, and for Nancy from 1800-1802. 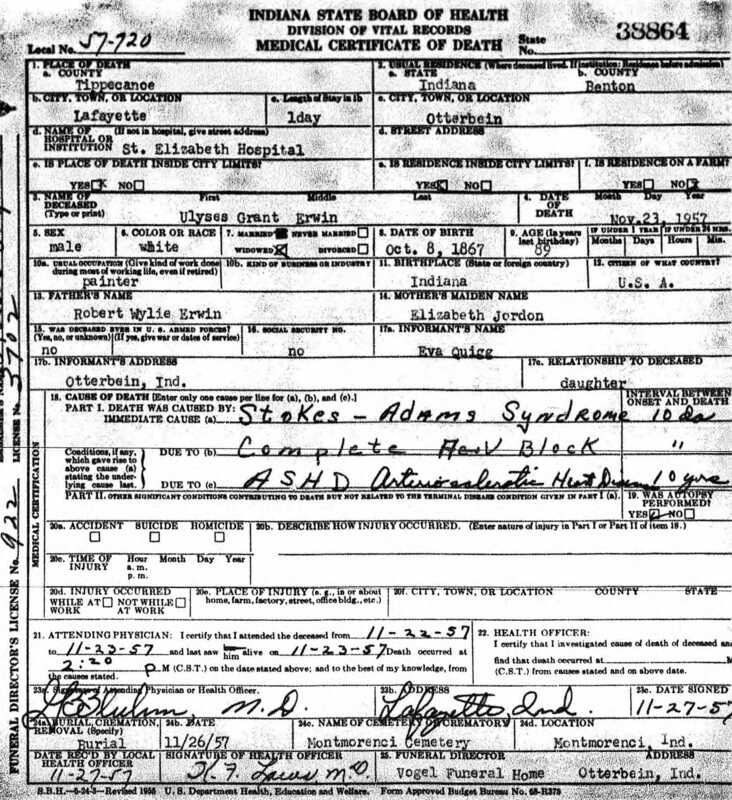 Indiana Death Certificates. Proof that Turza Jane Brown and Liles J. 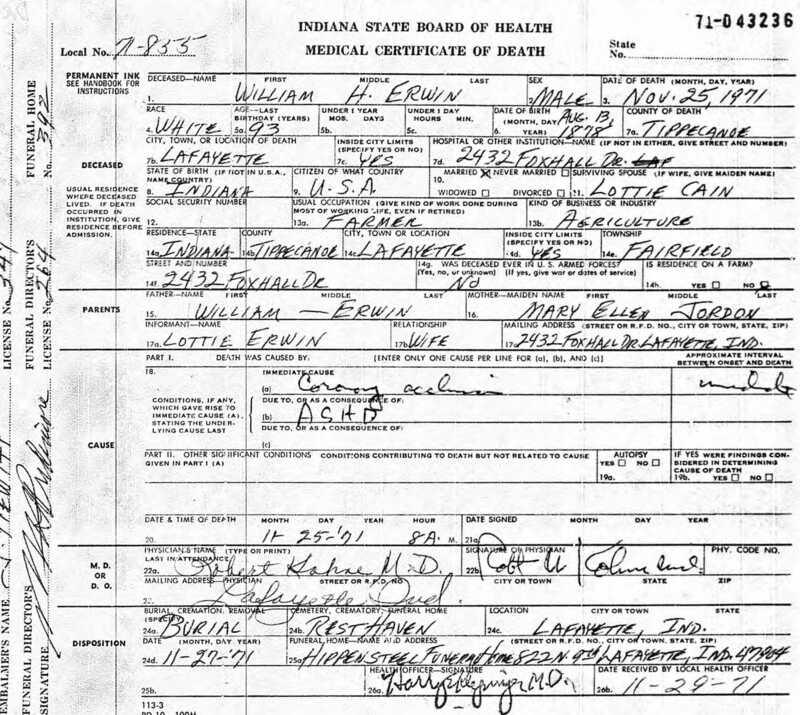 Brown are children of Anna Brown can be found in Tippecanoe County Court Order Book 5, May 17, 1847, when Nathan Brown receives guardianship for the two children. Photographs.